Shopkins Happy Places App is a brand new educational app for children from Kuato Studios. The app is totally free to download, In App Purchases are available in the game from £1.99. Available now to download via The App Store. “Hey SPK fans! After a big day out in Shopville, the Lil’ Shoppies are heading home to Happyville to make their own Happy Places! Moose Enterprises and Kuato Studios are proud to announce the arrival of the first official game for the massively successful Shopkins Happy Places brand. Shopkins Happy Places centres around a fun fictional place called Happyville and is a hugely successful spin off of Shopkins, one the most popular children’s entertainment franchises of recent years. The Happy Places toy line launched in 2016 and is now available in 65 countries across the globe. The Shopkins Happy Places game will open up a new world for Shopkins fans where they can collect cute Petkins and decorate their own Happy Places, all while completing House Goals with the help of their favourite Lil’ Shoppies. Whether it’s decorating an Oh-So-Cozy bedroom that’s a dream to sleep in for Jessicake, or helping Popette follow the latest trends to suit her laidback lifestyle, the game will allow kids to immerse themselves into Shopkins Happy Places like never before. In true Kuato Studios style, Shopkins Happy Places will give fans a fun learning experience based around storytelling and narrative play. Kuato’s patent pending TalesMaker engine allows fans to create visual diaries from their Lil’ Shoppies’ adventures throughout the day, and then share these with family and friends. Lexie has loved playing with the app the weekend and designing her house and completing the challenge and receiving the Shopkins delivery parcels. Moving House And eBay Finds. This week we moved from a two bedroom flat to a three bedroom house. The move went pretty smoothly and now it’s gonna take a while to get things in to places and make it absolutely perfect on how we want it. I know these things take a while and I’m happy to take my time to do room by room. Once rooms are finished I will be doing some before and after‘s as well. I wanted to share some eBay finds that I have purchased, eBay can be really hit and miss at times but I’ve been super surprised with some of the quality of the things that have came. First up are these curtain tie backs, my windows are quite big so I’ve had to go slightly bigger with a few pairs. I didn’t want them all to be dragging on the floor. So when browsing eBay I spotted these. Now I knew they would be really hit or miss, so when they came I was really happy. I think they really match the curtains and I think they look great up. They was £5.75 for two with free delivery. I was trying to find some pink blackout curtains in a sort of middle pink, we didn’t want a really hot pink or a tint of pink and I managed to find these for a respectable £16.99. I’ve learnt that curtains are super expensive ( especially when you are doing a whole house) They came with some standard tie backs and they was free delivery. Lexie’s theme is going to be unicorns. So I purchased this wall sticker for £3.99 which is personalised with her name. It was so easy to stick on and I think that it looks great as an added bonus to her room. Again it was free delivery and you can have it in a whole of different colours. For the Hall way and stairs I wanted some grey/silver lampshades that would give out quite a bit of light. The kids still have the hall light on at bedtime and if they ever got up to use the toilet in the night they need to see where they are going. These shades are solid , easy to put on and they look really nice. Only £9.99 with free delivery. They come in a heap of colours and to be totally honest if I hadn’t bought most the lampshades already I think they would be in most the rooms. Lexie isn’t a stranger to Glimmies, she had some fairy ones last year and she was super fascinated with the light up feature. Flair have extended the range with releasing the Glimmies Aquaria GlimSplash with a new design. Light-up your world with Glimmies! Discover Glimmies Aquaria, the super cute magical creatures living in Aquaria, an underwater village in Glimmies world! These little marine fairies are water activated and only light up in their natural environment. Immerse them into water and watch them magically light up! Take them out of the water and they will hide their light! Lexie has been super fascinated with her new Glimmies, not only are they all mermaid/fish designs they are actived when placed in under water. There are 17 different Glimmies to collect and the Aquaria GlimSplash is a great little place a magical underwater world. You can collect Glimmies in single packs and the Aquaria GlimSplash comes with one Glimmie inside. Stuck for a gift this year, look no further than the fantastic Baylis & Harding. They have bought out a fantastic brand new range for Mother’s Day. Packed with not only bath and body products to keep mom feeling pampered but also essential everyday items too. Pink gin fizz is the latest scent and as per usual it’s fantastic. Thinking about it I don’t think there has been one scent Baylis and Harding have done which I’ve it loved. So I moved in to a new house this week, a huge big house that needs lots of little touches that make it feel like home. Who doesn’t love a super scented candle. Baylis and Harding sent me the lovely Fuzzy Duck trio of candles, they smell gorgeous and look so pretty too. I love the pink and gold designs and it’s just what I needed for the new home. Also in the parcel was the Fuzzy Duck Pink Gin Fizz Travel Set. You know when we was plagued with white show last week, the fluffy socks was a lifesaver I think I wore and washed them everyday last week to keep my feet toasty warm. Including a travel cup,( which I’m using for the school run ) & foot balm to keep my feet super soft. 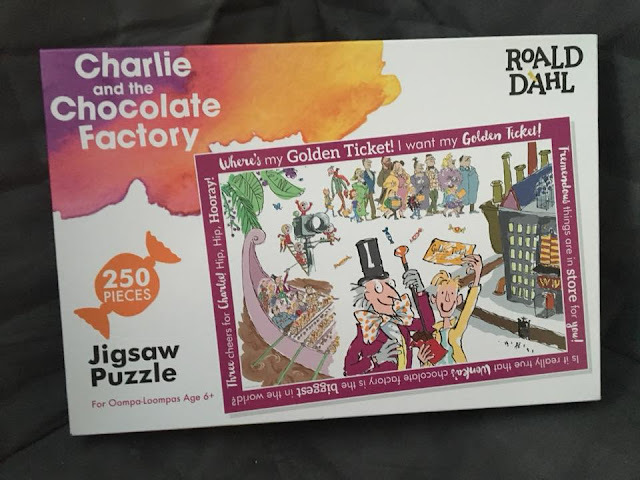 Charlie & The Chocolate Factory Puzzle From Paul Lamond Games Review & Giveaway. 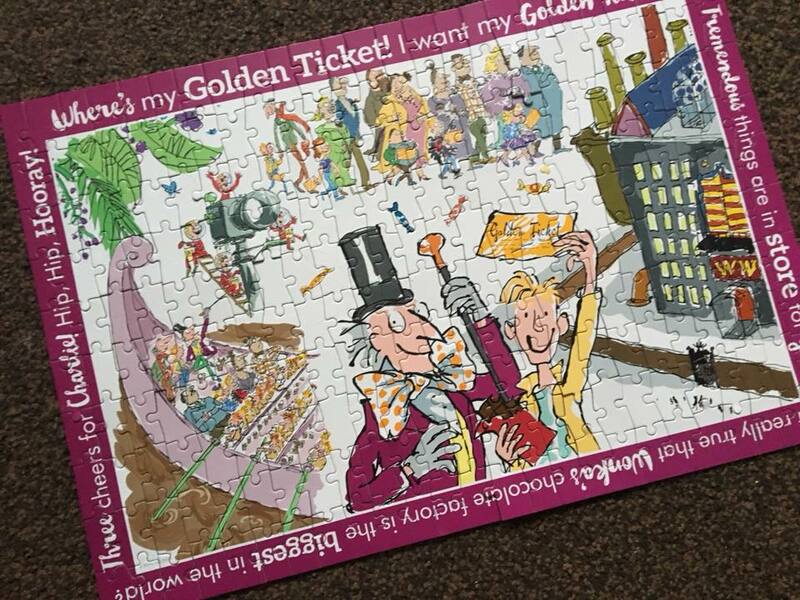 Today with being world book, we decided to crack on with a puzzle that we was sent from the Roald Dahl range from Paul Lamond games. Charlie & The Chocolate Factory is still my favourite Roald Dahl book of all time, I love it’s a mixture of all your chocolate dreams and still an absolute classic. The puzzle is for 6+ years and has 250 for you piece together and enjoy. 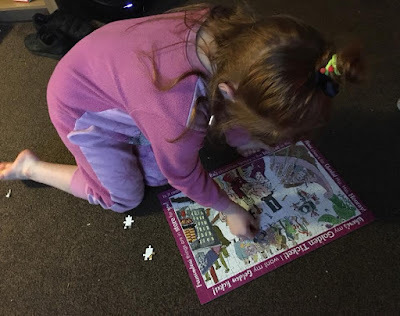 Me and Lexie did the puzzle together this afternoon as she was sent home from school with a bit of a bellyache. She really enjoyed trying to match the pieces up. We started from the edge and made our way in to the middle. Paul Lamond Games have a collection of Roald Dahl puzzles for you to enjoy, including. For your chance to win this puzzle for yourself, click on the rafflecopter below.